Good on Pokémon Platinum for keeping some characters outside of the traditional core circle relevant later in the main game. The brief mention by Byron that Roark is in fact his son and Maylene’s meeting back up with you as you both push through the blizzard toward Snowpoint City actually go a long way in making me more invested in the people living in Sinnoh. Even more appreciated is the game’s devotion to the Team Galactic plotline. It takes a while for the mystery surrounding them to reach a boiling point, but when it does is it impressive. I don’t think any of the other Pokémon games gave their local bad guy team so notable a leg-up with more than a few hours to go before the finale. While I had my complaints about the pacing during the game’s earlier stretches, it’s been pretty great ever since. As for the challenge factor from the gyms, they largely depend on which starter you chose. As I previously mentioned, I imported both Venusaur and Blaziken from Soul Silver, but if you were running solely with Pokémon caught in Platinum, you might find certain gyms significantly more challenging and/or frustrating. 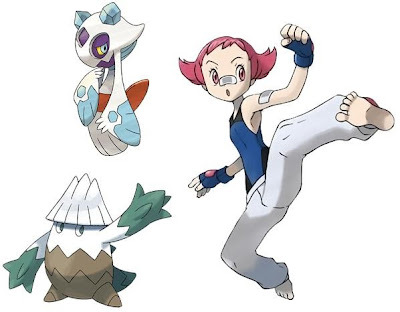 For example, Candice’s Ice types would be a pushover for anyone using Infernape, but could be a real pain for anyone using Empoleon or Torterra. Byron’s Steel types are weak to Fighting Pokémon as well as Fire, so Infernape is by default the best choice there as well, though both his Steelix and Bastiodon have dual typings that could be easily countered with the other two starters. All this traces back to Platinum's lack of support for newer generation Pokémon early on. True, the wild Pokémon you encounter after the fourth or fifth gym amp up the variety and are at higher levels, but there's still the factor of grinding for experience points at play. The game does, however, allow you to go ahead and scour Iron Island for extra items and experience points, and this is one of the game's best designed sub-areas. The generation IV Pokémon are shining through more noticeably now, while some of the generation II and III Pokémon have decided to lay claim to the abundance of wild encounters previously filled by generation I regulars. I did go out of my way to catch a Snowver, and though I have no real intention of using him during this particular playthrough, I don’t have many Ice type Pokémon well-suited for the Black 2 Pokémon World Tournament. Snowver’s Ice and Grass dual-typing may prove useful there in the long run. I also caught two Snorunts – one male and one female. The male will similarly be transported to Black 2 and evolved into Glalie, while the female has filled the final slot on my Platinum team as Froslass. I love Ghost type Pokémon, and the dual typing with Ice is an interesting, exciting combination.